On the dashboard, when you highlight the square with the Skylander image in, look at the bottom of the screen, you should have an option appear next to the "X" which now says "game details". Press X, then highlight and select the install option. Wait a while (depending on disk size) then you're free to play from the hard drive. You still need the disk in the tray to verify you own it, but then it reads off the HDD rather than the physical media. Increases loading speeds between levels, cuts down on the wear and tear on the optical drive and might just solve your glitch. Link here with pics if that helps eliminate one issue for you. Nearly finished the Giants campaign with my 5 year old son. The new "Ambushes" are my only real complaint about the game. 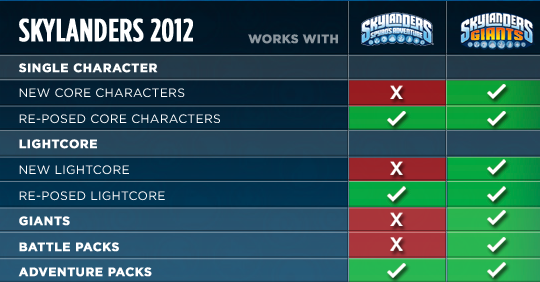 They just seem like a blatant ploy to kill off the current Skylander character you're using and force you to swap in several new characters. The first ambush you encounter in the game, even on easy mode, slaughtered 6 of my kid's charcters, including two giants. If we had just had the starter pack, it would have been "game over, restart the level" in no time. Should've at least hovered over the link. I'm on PS3. I was in JC Penney's tonight and saw they have all their Skylanders stuff roughly 30% off. The Giants individual guys were $10 (normally $15 - I think). The individual Skylanders were $6 or $7 depending on who it was. Sounds like at least all the SoCal JCP's are running this sale currently. Not sure about the rest of the country but you could call your local one and check if you're looking to add a character or two. My local store had a decent selection. Sounds like someone made out like a bandit! So I got Giants for my 6 year old for Christmas. We just finished the game last week and he now has 7 characters but he wants more. Unfortunately, the one character he really wants is Thumpback. From some quick googling it looks this that character is "out of print" and is now being sold for anywhere from $69 to $125. Several other characters also seemed to be going for this amount. Does anyone know of any good sources to find stuff like this cheaper or is this just what's expected for the more uncommon characters? Thumpback and Eyebrawl are being advertised as coming out January 24th in Australia, so I dare say it will be the same globally, or you guys would get it a bit before us. Those prices are probably people who've got access to early stock and taking advantage of it. And as bit of extra grrrrrrrrr for those Skylander Scalpers, they're going for $100+ on the Australian eBay store. I just hope they come out soon considering my son has already beat the game. It is easier than the first one, my son did not use nearly as many skylanders to beat the end boss this time. I was at gamestop yesterday and was told that Eye Brawl and Thumpback came on the last shippment, but of course they sold out. This gives my son hope that he will soon have Thumpback, which in turn will relieve me of my son asking for him everytime he plays Skylanders. My daughter is still hanging out for Nin-Genie (?)... I envy you. Good luck, Ninjini is the only one that has not been released yet. For your sake I hope it comes out soon. Mine just put them on the shelves today, and I was able to grab Thumpback, the object of my kid's pining. Hopefully the online prices will reach sanity soon. So my son has beat the living stew out of Skylanders Giants and can now completely upgrade a character the same day he gets them just by running a few arenas over and over. If I were to buy just the game for the original Skylanders are all of the characters, except the giants of course, backwards compatible? This chart should answer your question, if I understand it correctly. Today we found Eyebrawl at our local target store, when my son got home from school he was jumping all around the house with it. I found Eyebrawl, Thumpback, and HotHead Giants on the weekend. Igot them straight out of the box as the stock arrived at the store. The poor sales clerk had decided to 'open the shipment' in the aisle, rather than out the back. I spied them, and enquired if they had any of the new giants in the box. When I got home, I hid them on the stairs to our upstairs gaming area. We got all the chores done, then I just said,"Lets head upstairs, we've done well this morning". Blew their minds as they rounded the corner and saw them sitting there. Skylanders SWAP Force features 16 new SWAP Force characters, along with 32 core Skylanders characters (16 completely new Skylanders and 16 new versions of fan favorite characters from previous games) and eight new LightCore™ characters. Skylanders SWAP Force also delivers high-resolution graphics that bring the game's detailed characters and rich environments to life, immersing players in the gameplay like never before. My wallet is not happy about this announcement, not happy at all. Swap force? Sounds like Skylanders: Swingers. I hope it takes a while before comercials for this is viewable for my son. I would be ashamed of anyone who does not collect skylanders to know how much I have already dumped into this game for him. I count it as a major coup that I was able to hide the existence of Giants from my kids until that opened it Christmas morning. I hold no such hope for Swap Force. I was at ToysRUs last night buying a birthday gift and saw that they are selling the Spyro's Adventure series for "Buy 1, get a 2nd 75% off". Our collection is still pretty small so I let my son get a Chop Chop and Legendary Trigger Happy. Also, it seems like stores have tons of "gear" overstock and maybe a few wind & fire creatures. Any ideas why? Would love to get a Spyro but I've never seen him in a store. Legendary Bouncer, a TrU exclusive. We can't find it anywhere in our city and I refuse to pay Ebay prices. If anyone in the US/Canada comes across it in yoru travels I would Paypal you the payment price and shipping and a bit extra for your trouble. If I make it to Toys R Us I will see if I can find one. If you pick one up, just feel free to post to let us know. of course. we've checked our TrU 3 weeks in a row and no luck. I'm beginning to think they only made a dozen of them! No. No. Back near Christmas there were at least 50 in the Olympia WA store...one whole section of those. The sad thing is my son deliberated over getting one of them or a new version of Trigger Happy. He went with the latter partly because I told him there were so many of the TrU Bouncer that he could always go back and get one! I stopped by today to check, but nada...sorry. thanks for checking. I'm hoping they will restock before the new Skylanders comes out this fall. we may never see it again. Man I dig this game. My collection is nearly complete, but it seems like Drobot (non-Lightcore) and Lightcore Hex aren't available yet. I'm not sure I'm onboard for Swap Force yet. I've seen some of the Adventure packs locally. If anyone was looking for anything in particular, I can keep my eyes open for you the next time I'm in Target.